I wasn't able to download the sample invitation for my dragonfly bride Sunday, so here you go. 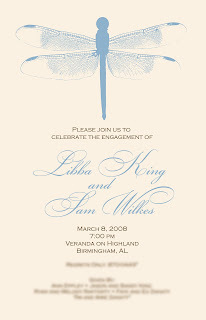 Envision a smaller dragonfly in orange....just perfect for an out door cocktail reception! Thank you Razzle Dazzle Creative Design!